Yesterday I wanted to test out a recipe for valentines day brownies. Since each Tuesday is our Community Wellness staff meeting at Kishwaukee hospital, I thought it would be a perfect test panel of 10. It seemed to get rave reviews and many are going to make it for their valentine. Well I came home with an empty pan!! In saucepan melt fat. Remove from heat and mix in cocoa – cool a bit. Stir together sugar, puree, egg and vanilla. Then mix into the cocoa mixture – blend well. Add all of this to the flour mixture and stir until flour has disappeared. 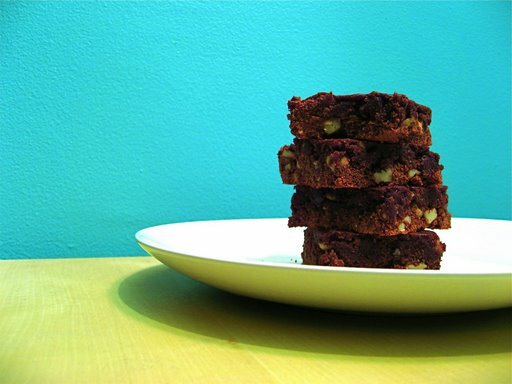 Spread evenly into prepared pan and bake 20 to 23 minutes – you will smell the brownies (a good sign to check them) To be sure they are ready insert a tip of a knife and if just a few crumbs stick it is done. Cool and enjoy with your favorite valentine. You know cooking is LOVE — so share some love today! Looking for gifts – my super cute Heavy Duty Shopping Totes and Organic Cotton T-shirts are available at Sweet Earth downtown Sycamore – or straight from me. After running across a bag of Kamut in the freezer (it is an ancestor to wheat) I was inspired to make something with it. Before work – measured 1 cup of grain and put it to soak covered with water for the day. Soaking helps cook faster but also reduces the acid of the grain and makes it more digestible. Returning home – rinsed it and with 2 cups water and pinch of salt brought it to boil, then covered and simmered around 45 minutes (I like it a bit chewy you can cook it longer). So what to do? 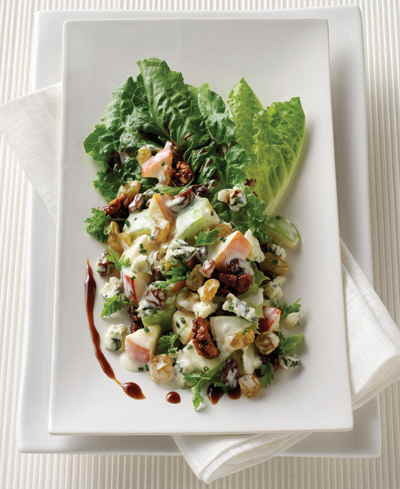 I spotted some apples and knew we had celery … oh a sort of Waldorf Salad! Cut up 2 apples, 3 stalks celery, handful sunflower seeds and another of craisins. Dressing: 1/4 cup mayo, 1 generous tablespoon Dijon, dose of rice vinegar about 1 1/2 tab. season with salt and pepper. We ate it on a bed of greens. We had some leftover Turkey chili from the night before to add to the meal. Now I have a great salad for lunchtime today. You can vary the grain using rice, bulgur or whatever you have. Cannot wait to share my new adventures with you! The winter recipe card collection is available at Sweet Earth downtown Sycamore; Duck Soup Coop in DeKalb and Creative Therapeutics. I will be ordering some more fall sets for those of you asking – let me know so I can reserve one for you. 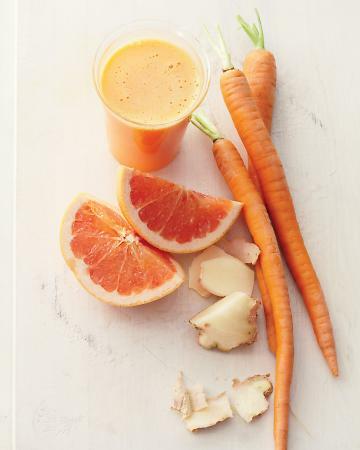 This weekend put a list together for these two yummy recipes they will jump start your morning. As I write this email my “Sunshine in a Glass” is making me smile! water to thin if needed. Puree in your vita-mix; food processor or blender. Water will depend on how juicy the grapefruit is. Mix dry ingredients together mix well. Whisk together wet ingredients until blended. Combine the two separate mixes. Fill each cup full you may have extra for 1 or 2 more muffins. Bake 18 to 23 minutes, check the muffins with a toothpick when inserted in the center comes out clean. The Chia expands 12 times its weight so while in your digestive tract they soak up fluid and you feel very full thus you can lose weight as you feel full. Another benefit is the omega-3 fatty acids and omega-6 these fatty acids provide heart health and other benefits to skin, hair and nails. Calcium is also a perk especially for vegetarians who avoid dairy. The Chias give 18% RDA per ounce of calcium – wow can you imagine if you paired them with dark leafy greens – a calcium packed punch! Have fun with the chia – an overnight “pudding” soak 1 tablespoon chia seeds in 1 cup milk (almond, rice, hemp or other favorite) in the refrigerator. The next day you will have a pudding consistency eat as is or sweeten with honey, maple syrup or your favorite natural sweetener. Dress it up with nuts and dried fruit. We just got a new HyVee store here in the area – it was quite the event in our little town. You could not get a parking spot for the first several days of the opening. What is most exciting to me is the beautiful selection of produce available. On my last trip I was fascinated with all the different melons they had. Today I had a couple of special friends for lunch and here is one of the side dishes I made with a couple variety of melons. 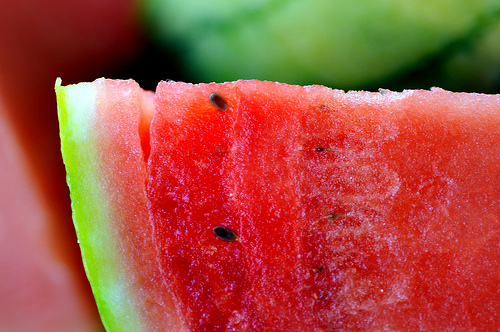 Refreshing, delicious and of course beautiful! We coarsely pulsed it in the food processor. At this stage it could be a sprinkle on grilled fish or chicken. Take it a bit further with a bit more liquid (water or more lemon juice) and you have a nice spread. Taste and adjust sometimes greens can be bitter so add a bit of maple syrup or agave. Also you can add parmesan if you would like. -just eat it by the spoonful! Yesterday I spent the afternoon with my mom at her farm. We feasted on asparagus from her patch and we made my favorite Rhubarb Custard pie together. A delightful and delicious afternoon. 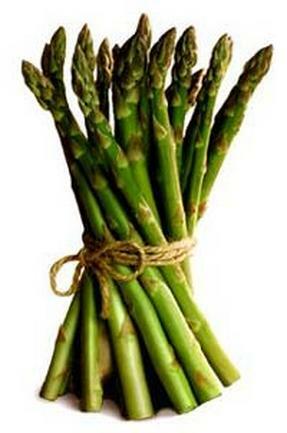 She sent me home with a bag of asparagus to use. Well today is cool and cloudy and I wanted to make a hearty salad and here is what I came up with. add 1 carrot finely julinenne or chopped and pinch or red pepper flakes – saute just until soft. Cook 1 cup qunioa with 1/3 cup of currants in the water – just follow directions on package. Enjoy it with a big smile on your face!! !